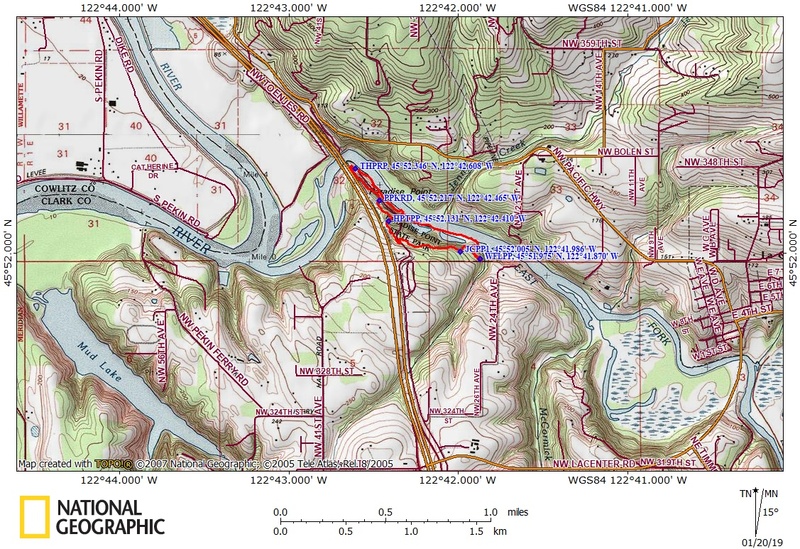 Vicinity Location: The trailhead is about 25 miles north of Portland, Oregon. Directions: From Portland take I-5 north past Vancouver, WA. Continue on I-5 N to exit 16. Ilani casino is at this exit and there is a sign for Paradise Point State Park. Exit the freeway and turn right at the traffic circle. After about 200 feet turn left onto NW Paradise Park Road. Follow the road for about 1.8 miles, turning left when in the park, to the day use parking area by the East Fork of the Lewis River. The parking lot is almost under I-5. A State of Washington Discover Pass is required for parking. 2.0 miles. Elevation gain is 285 feet and elevation loss is 285 feet. Elevation at the trailhead is 40 feet and the high point is 195 feet. The low point is 40 feet. From the day use area start walking to your right, heading upstream. There are tranquil river views along the riverbank. In a short distance you will find the beginning of the trail right along the river. It parallels the river for about 500 feet then climbs up stairs to a winding trail above the river. The trail stays above the river for about 0.3 mile as it meanders up and down before dropping back down to the riverbank on a series of steps. Portions of this section of the trail has a slippery tread of muddy clay when wet. Take special care getting through this section. Follow along the river over a couple of little bridges on a grassy path for about 1/3 mile. This portion of the trail is far enough from the freeway that you can enjoy the quiet river. After passing scattered trees and wetlands on the right, climb up above and a little away from the river. There is a small stream with a waterfall on the left. The waterfall is about 15 feet high. Continue up along the stream to a platform overlooking the waterfall. There is a little user trail that leads down to the top of the waterfall. Retrace your steps from the overlook for about 200 feet to a junction that leads uphill. Follow the trail as it leads uphill and it flattens out in an open grove of cedar trees that tower above your head. The grove transitions into maple trees and fir trees as you gently climb a little higher. Follow through the forest to a little meadow that comes out to the road. Look uphill about 50 feet to the left to find where the trail continues on the other side of the road. The highway noise from I-5 is pretty loud in this area. The rest of the loop is close to I-5 and noisy so if the river trail isn’t too muddy then a good choice is to turn around there and retrace your steps back to the car. To continue on the loop, cross the road and follow the trail into another clearing alongside the road. At the downhill side of the clearing look to the left to find the trail as it re-enters the woods. From here climb up to the highest point of the trail. With the thunderous sounds of the nearby freeway, drop down the other side of the hill and the trail soon joins the road and ends. Cross over the road and walk along the shoulder and the edge of the pavement back down to the parking lot. This trail has some hazards because it is next to a river that is bank-full in the winter. There are places where slick mud could cause to slide down the hill into the river. There are some cliffs where a tumble could result in significant injuries and inattentiveness could result in falling into the river.